Community Description: These closed canopy forests are dominated by a combination of beech, yellow birch, and sugar maple. Paper birch, red maple, conifers, and red oak may be present at lower cover. Conifers and red oak can each have <25% cover. Striped maple is a common subcanopy tree. The variable shrub layer is dominated by tree regeneration. The herb layer may be dominated by tree seedlings. Herbs are sparse, usually <15% cover; but cover, richness and composition vary with site conditions. Nutrient rich sites, such as many areas of northern Maine, tend to be dominated by sugar maple and have herbs such as yellow violet, zig-zag goldenrod, and common grapefern that are absent elsewhere. 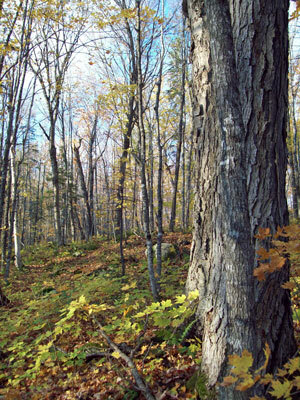 In contrast, sites on more sterile soils Downeast or drier ridge tops in northern Maine are typically dominated by beech. Back to top. Soil and Site Characteristics: Sites are typically found on the lower to middle portion of hillslopes (slopes generally 10-50%). Soils are generally mesic and well drained, though not deep (typically 15-50 cm) silt loams to sandy loams to loamy sands formed over glacial till, with pH 5.0-5.6; some occur on stabilized talus. Elevations range up to 2000'. Back to top. Diagnostics: A combination of beech, sugar maple, and yellow birch distinguishes this type. Though red oak is often entirely absent, conifers and red oak can be present and have up to 25% cover each. The herb layer lacks rich site indicators such as Dutchman's breeches, maidenhair fern, and blue cohosh. Back to top. Similar Types: Enriched Northern Hardwoods Forests and Sugar Maple Forests are similar to, and often contiguous with, this type. 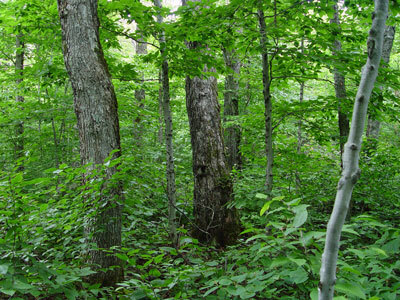 In them, beech is far less abundant, white ash is usually well represented in the canopy, and the herb layer contains species indicative of rich-soil areas. Oak - Northern Hardwoods Forests have a higher proportion of red oak and can have a higher proportion of conifers (>25%). Spruce - Northern Hardwoods Forests also have >25% conifers in the canopy. Back to top. Conservation, Wildlife and Management Considerations: This is the dominant hardwood type in Maine, and therefore is extensively harvested and managed. Most management techniques diverge from the natural gap pattern, which is at the scale of single trees or small groups of trees. Large (>1000 acres) examples reflecting only natural disturbance are scarce statewide, and intact examples in central and southern Maine tend to be smaller and more isolated. Beech scale disease (Nectria) has devastated beech in many stands in eastern Maine. Although beech regenerates vigorously from sprouts after the trees have died, most sprouts succumb to the disease by the time they reach maturity. There are indications that some trees may express a genetic resistance to this disease. This broad type provides nesting habitat for a large number of passerine bird species, such as the Black-throated green warbler, pose-breasted grosbeak, scarlet tanager, and ovenbird, and a large proportion of the global population of black-throated blue warblers. The globally uncommon early hairstreak butterfly uses beech as its larval host plant. Back to top. Distribution: One of the predominant forest types in the New England - Adirondack Province and Laurentian Mixed Forest Province. Extends east, west, and north from Maine; occurs only as scattered areas southward. Landscape Pattern: Matrix, typically hundreds of acres; high-quality patches usually now smaller. Back to top. Baxter State Park Piscataquis Co.
Big & Little Squaw Mountain Public Lands Piscataquis Co.
Bigelow Preserve Public Lands Franklin and Somerset Co.
Grafton Notch State Park & Mahoosuc Public Lands Oxford Co.
White Mountain National Forest Oxford Co.